While nowhere as large as their fellow immigrants from Germany or the Scandinavian countries, Iowa has also been home to a number of Scottish immigrants, who worked as farmers, coal miners and sheepherders across the Hawkeye State. Scottish immigration gradually increased from the early 1850s (Iowa became a US state in 1846) so that by 1890, some 7,000 Scottish immigrants were recorded in the Federal Census as residing in Iowa, according to Dorothy Schwieder’s Iowa: The Middle Land. Another Iowa “river city”, Davenport, claims Dundee native James MacKintosh as one of its founding fathers. MacKintosh, the grandson of a veteran of the Battle of Culloden, opened a dry-goods store in the new settlement of Davenport, as well as serving as Iowa’s first bookbinder, land speculator and surveyor. MacKintosh was killed serving in the Union Army during the Civil War. Another Civil War veteran, Glaswegian Andrew McDonald, the “fighting plumber” of Dubuque, immigrated to the United States in 1854 and soon gained a reputation in the Mississippi River valley as a skilled plumber. In 1861, a little under a year of becoming an American citizen, McDonald joined the 1st Iowa Infantry and was wounded at the second major battle of the Civil War, Wilson’s Creek, Missouri. McDonald, who was left on the field, was taken as a prisoner by the Southerners, and even met a fellow Scot from his days in St. Louis who was serving with the rebels. McDonald was eventually released and returned to Iowa, where he promptly re-enlisted and was wounded again at the Siege of Vicksburg, Mississippi in 1863. During that time, he was granted a patent on a screw wrench, otherwise known as the “monkey wrench”. The company he founded, A.Y. McDonald manufacturing, is still in business today. Settlements of Scottish immigrants could be found in Southeastern Iowa, such as Tranquility, in Appanoose County, where a description of young Scots at Kirk (church) in “velvet tams and kilts” was given by a fellow expatriate and writer, Janette Stevenson Murray. The town of Scotch Grove, in Jones County, was founded by Highlanders in the late 1830s from the failed Red River (Canada) Colony of Lord Selkirk, and during the 1870s a Scottish evangelist preached a sermon in Gaelic in the Presbyterian Church of Scotch Grove, causing many an old settler to shed a tear for their native land. Scottish settlements in Cedar (Red Oak Grove) and Poweshiek Counties were settled largely by immigrants from Aberdeenshire in Northeastern Scotland, who located first in Ohio in the 1830s before moving to Iowa in the 1840s and 50s. Unlike some immigrants, who were attracted to settlements by professional recruiting agents, the majority of the Cedar and Poweshiek Scots came because of communication between friends and relatives. Marjory Harper’s Emigration from North-East Scotland gives a very detailed account of these Iowa Scots. Other Scots from the North-East and Aberdeen were enticed to Des Moines County in 1848 with a description of large, cheap and fertile tracts of lands in the October 25, 1848 edition of the Aberdeen Journal. There were two classes of membership, benefit and social. The ritual of the Royal Highlanders was based on the story of William Wallace and Robert the Bruce in their struggle for Scottish independence, and was intended to teach “Prudence, Fidelity and Valor”. Degree teams wearing kilts and glengarries and carrying shields and spears initiated new members into the Order. The orders emblem even bore the heart of Robert the Bruce. In 1930, the Order numbered some 17,000 members, both men and women, with “extensive investments” in Nebraska farmland. Seven years later, the Order reincorporated to become a mutual life insurance company, and renamed itself the Lincoln Mutual Life Insurance Company in 1946. An article from the Ida County (Iowa) Pioneer Record from 1946 documents the history of the local Royal Highlanders castle, which was formed in 1898 with a charter membership of 35 businessmen and citizens. In 1902, the castle organized a membership drive to “make the society one of the largest organizations in Ida Grove.” Within a short time, 70 new members were secured, and on July 31, 1902, the “Bonnie Doon” drill team, along with Royal Highlanders President W.E. Sharp and his wife, came from Lincoln Nebraska to participate in the initiation ceremonies. 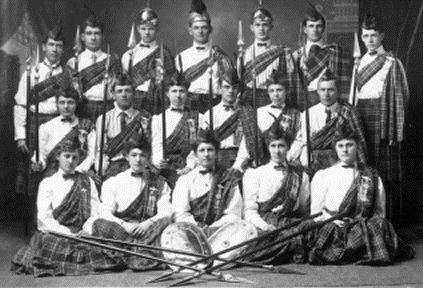 The next year, the Ida Grove castle began to organize its own drill team, which was outfitted in “plaid kilties, bright shields and spears”. The drill team then helped institute new castles in nearby towns of Danbury, Odebolt and Holstein. The Ida Grove drill team was “ranked among the best in the state”, according to the article, and even attended the Royal Highlanders’ national meeting in Denver, Colorado in September, 1909, it being the “only team from Iowa”. The Drill Team of Ida Grove Castle No. 130, Royal Highlanders, Ida Grove, Iowa, circa 1909. Photo courtesy of Judith Bauer, whose grandfather, J.E. Moorehead, is the second from the left on the back row. The town of Odebolt also had a Robert Burns Society, with members made up from the Scottish farmers of Ida and Sac Counties. A newspaper account of the Burns Supper of 1906 lists the “bill o’ fare” for the evening, complete with piping, songs and poems from Burns and of Scotland, Scottish Country & Highland dancing (including a sword dance) and a party which continued on until 7.00 am - the evening’s festivities had begun at 7.00 pm! 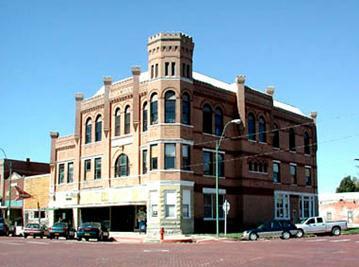 The Odebolt Opera House was the venue for the 147th anniversary of the birth of the ploughman poet. Dubuque, Iowa, also celebrated the life and works of Robert Burns with a Burns Supper near the 100th anniversary of the ploughman poet’s birth in 1859, and then later with a St. Andrew’s society, which celebrated Burns’ birthday and St. Andrew’s Day on November 30th, as well as providing mutual aid “to the unfortunate and poor whether or not they were Scottish.” It is interesting to note that the society suffered a schism in December of 1859 over the issue of temperance! In 1936, Colonel George Dailey of the University of Iowa’s Reserve Officer Training Corps (ROTC) program organized a pipe band to perform at Iowa football games after seeing the band of the Black Watch while overseas in the First World War. During the Second World War, the band became all-female in membership due to male students serving in the armed forces. Over the years the band has performed in parades and festivals across Iowa, the United States and the world, and has played for a number of US Presidents and other dignitaries. The university cut the band’s funding in 1981, but it still operates today as a student interest group. Today, The Scottish Heritage Society of Iowa, with its three chapters, continues the efforts of these earlier organizations to promote Scottish heritage and culture. Other Iowans of Scottish heritage include Henry Wallace, who served as Secretary of Agriculture and Vice-President under Franklin D. Roosevelt, as well as a presidential candidate in 1948; The noted author Norman Maclean, who wrote a fictionalized version of his Scottish-American family’s story in A River Runs Through It and one Marion Robert Morrison of Winterset, who later changed his name to John Wayne.